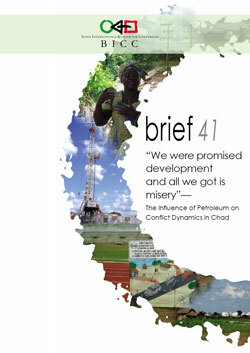 BICC brief 41 analyzes the effects of oil production on conflict dynamics in Chad. The authors, Lena Guesnet and Claudia Frank conclude in the study that the goal of the project supported by the World Bank, to foster development in the Central African country has failed miserably. The Chad-Cameroon Oil Pipeline project was supported by the World Bank as a model to prove that investment in oil can yield positive results in terms of poverty reduction and development. BICC brief 41, however, shows that oil revenues are insufficiently invested into development sectors, such as health and education. The population living in the production area in the south of Chad suffers from environmental degradation and receives only insufficient reparations for their deteriorating living conditions. Not only does BICC brief 41 analyze the influence of oil revenues on conflict potential on the local level around the oil production site and how they directly finance violent conflict but also discusses conflict around revenue governance. Additionally, this brief addresses impacts of new oil fields and the role of the Chinese state-owned oil company China National Petroleum Corporation (CNPC). Finally, the study investigates to which extent oil production has influenced the regional conflict system between Chad, Sudan, and the Central African Republic.